Born and raised in San Antonio, Texas, Dr. Cynthia (Cindi) Delany was an avid animal lover from an early age and seemed destined for the animal sheltering industry, spending many hours designing (to scale) the animal rescue facility she dreamed of running as an adult. Dr. Delany completed an undergraduate degree in Business/Economics at UCLA in 1993 with the goal of entering the animal sheltering industry on the management side. After realizing that the need to interact directly with animals was too great for this to be an ideal career choice, Dr. Delany applied to UC Davis’s School of Veterinary Medicine. Dr. Delany obtained her DVM from UC Davis in 2000. While in veterinary school she was active in the animal sheltering industry (before shelter medicine as an area of focus had really been developed) volunteering at local animal shelters and rescuing dogs and cats, providing them with medical and behavioral care before finding them permanent homes. When the UC Davis Shelter Medicine Program was started in 2001, less than a year after she graduated, Dr. Delany joined the school’s program to become the first Shelter Veterinarian Sacramento County Animal Care and Regulation in Sacramento, CA had ever employed. At that facility Dr. Delany learned the importance of individual shelter animal care, but more importantly the concept of population management for the shelter as a whole to maximize positive outcomes for animals. Dr. Delany quickly acquired expertise in developing and implementing medical and population management protocols with a focus on improving operations to maximize efficiency and increase positive outcomes for the animals. In this high-volume shelter (intake of 24,000 animals a year) she learned the importance of using community resources – including foster homes and rescue groups – as well as facilitating redemptions of animals by their owners and increasing adoptions by removing barriers to adoption, to improve live release rates. During this time Dr. Delany developed particular expertise in emergency care in the shelter, development of foster programs, neonatal/pediatric medicine, soft tissue surgery, high volume/high quality spay neuter, pediatric spay neuter, foster program creation and management, live release program implementation, the use of technology – including shelter database systems – to collect vital information on shelter performance, and the use of statistics to analyze and improve outcomes for animals. Since joining the program in 2001, Dr. Delany has actively lectured within the UC Davis School of Veterinary Medicine as well as at local and national conferences on these and other topics. Also in 2001, Dr. Delany founded California Animal Shelter Friends, a 501(c)(3) non-profit corporation that focuses on rescuing sick, injured and newborn or underage animals from shelters and veterinary practices where they have been abandoned. She has continued to run this rescue group, expanding it over the past 15 years from one room in her home in 2001 to a 2,000 square foot building on her current property. After spending several years as the Chief of Staff at an emergency clinic, Dr. Delany rejoined the restructured UC Davis Shelter Medicine Program in 2011 and took on the role of Supervising Shelter Veterinarian for the local shelter, Yolo County Animal Services. Focusing on improving efficiencies of operations, harnessing technology and statistics and implementing population management practices, Dr. Delany was instrumental in helping that facility improve their live release rate from 50% to 90% in less than 2 years. Currently Dr. Delany also participates in animal shelter consultations as part of the UC Davis Koret Shelter Medicine team, with a particular emphasis on programs targeted to improve animal outcomes, provide environmental enrichment for shelter animals, explore shelter animal behavior and training, improve shelter data collection and analysis, and maximize operational efficiencies in a limited resource environment. When not involved in the world of animal shelter medicine, Dr. Delany loves spending time with her partner, Jaleh, who also works for UC Davis as an Animal Care Supervisor, and spends time with her own animals – including 5 dogs (2 Border Collies, 1 Australian Shepherd, 1 English Mastiff and 1 Leonberger), her 2 indoor owned and 2-5+ outdoor/community cat property residents, 3 miniature donkeys, 1 rescued Percheron draft horse and 2 Bactrian Camels. Dr. Delany has a special interest in animal behavior and positive reinforcement training and uses these techniques (including clicker training) with all of her animals – including the camels. 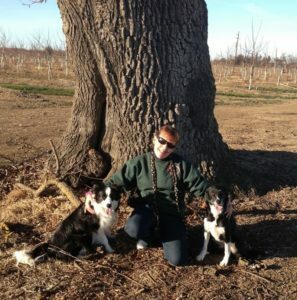 Dr. Delany and her Border Collies are active and successful in the world of dog agility competition and she is currently training her 17.2 hand, 1,700 lb Percheron for competitive trail riding and working with her 2 young camels on basic ground training in preparation for training them to be ridden. In addition to all of these animal activities, Dr. Delany is a self-admitted computer nerd and loves working with high tech toys, software, apps and other computer related devices. You can email her at cddelany@ucdavis.edu.